As a professional in the beauty industry, my hands are subject to a billion washings per day with all sorts of cleaners, alcohols and sanitizers. I swatch color after color, mix, blend..all that jazz! You name it, I do it. However, when I get home, I am mom. I cook and clean everyday. Needless to say, my hands often look like I’ve been farming or playing in mounds of chalk dust. I’ve tried homemade hand treatments loaded with oils that didn’t fully absorb into the impossible top layers of dryness. I’ve done the old Elizabeth Arden Eight Hour Cream trick and it didn’t work. Alas, Karuna Skin has blessed the earth with not one but TWO new moisturizing and renewing hand treatments that are a major breakthrough in moisturization. Both masks are genrously sized and would be suitable for a man or woman’s hands. 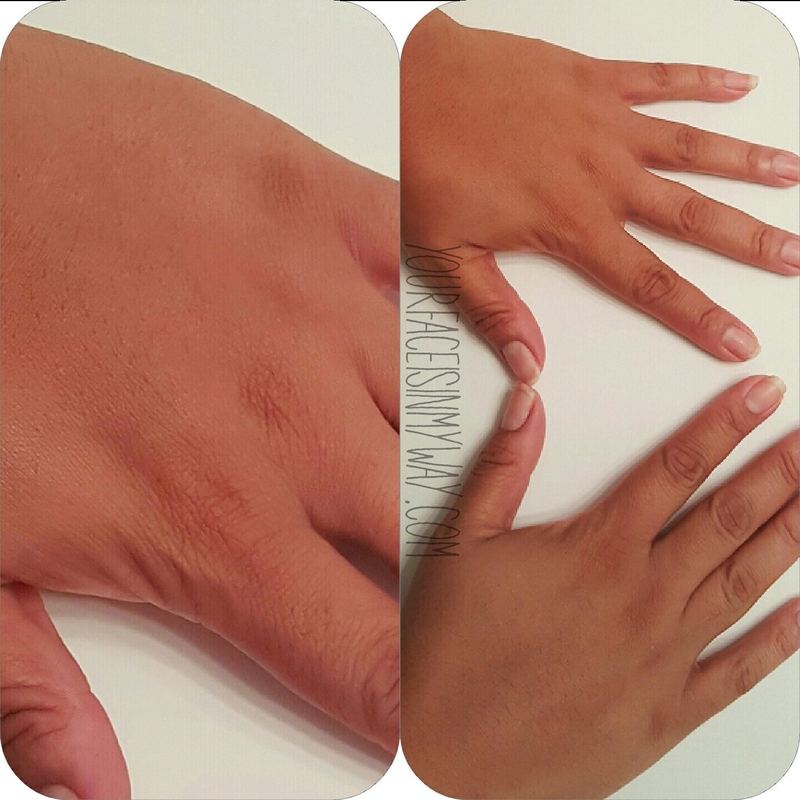 This post will be focusing on the Age Defying+ Hand Mask. I was lucky to be chosen as one of their VIP memebers, so I was able to get these in advance to their release. This mask is for those of us with signs of aging on our hands. This helps to brighten age spots and restore moisture. 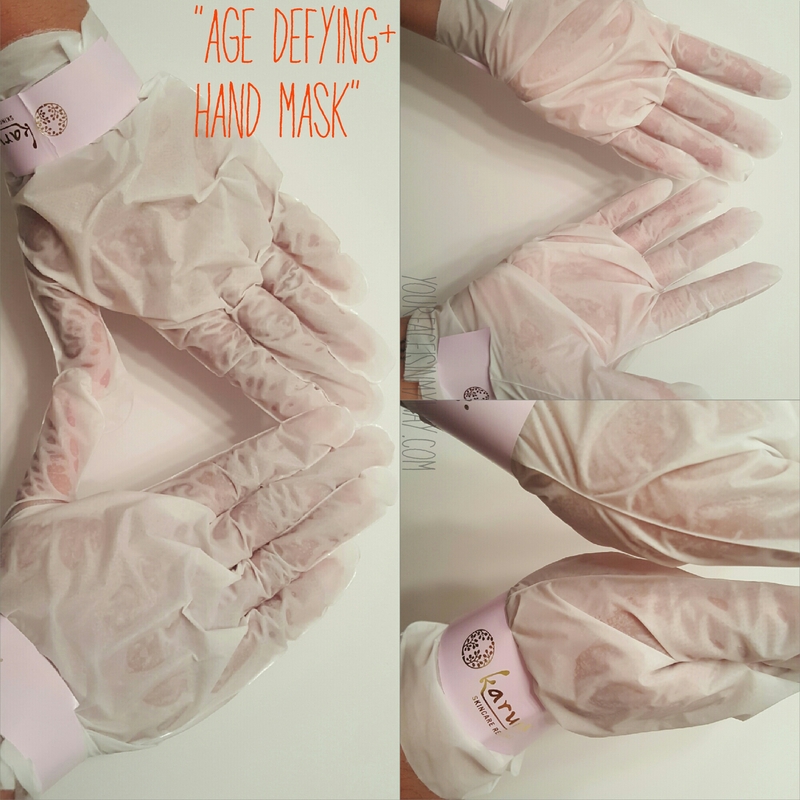 Age Defying+ Hand Mask can transform dry mature skin into softer, smoother skin with reduced age spots. I don’t have age spots just yet, but I do have really dry skin. The masks fit very well over my big hands. Arbutin and Niacinamide help brighten the skin. Shea, Jojoba and aloe help moisturize. 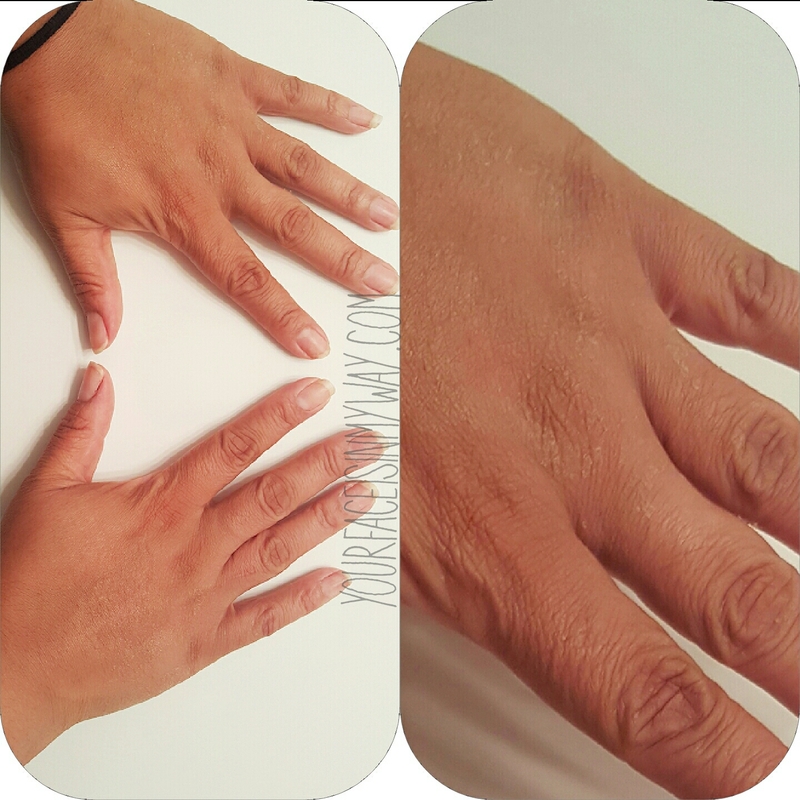 The Hydrolyzed Collagen helps plump the skin and prep the hands for optimal moisture retention. Lactic, Glycolic and Grapefruit acids help gently exfoliate. You can see here the dry flaking skin on my hands and fingers. Please excuse my unpainted nails. The dry flakiness has lessened significantly after wearing the mask for 20 minutes. My hands felt soft and smooth for about a 4 days after one treatment. I’ve used this particular mask 3 times over the past few weeks and I am very impressed with the results. They smell divine! I mean, DIVINE! I will definitely be purchasing these. Overall, I give this a 10/10. The Karuna Age Defying+ Hand Mask can be purchased here. They are $32 per box of 4 masks. They are also sold individually for $9.50 each. WOW!!!! Amazing, I must try! Karuna is so fab.